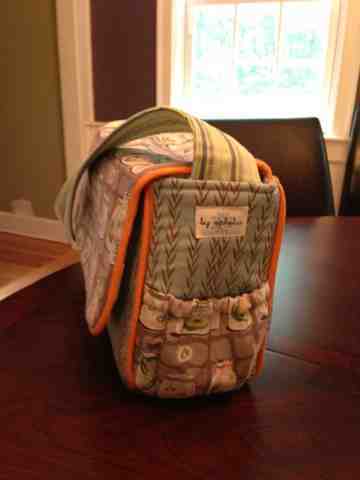 on the Birch Organic Fabric site for a little backpack, I was hooked. 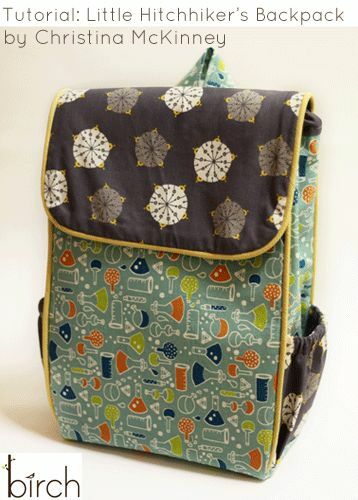 Problem is, though I definitely have this robot fabric in my stash, and it's adorable, I wanted a more grown-up version of the bag, with fabrics that reflect my unfailing sophistication, (hence bugs in jars.) 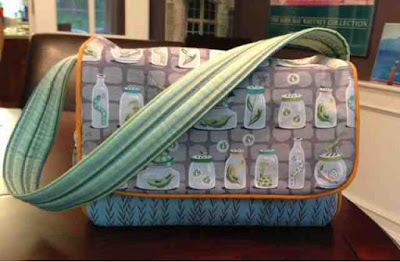 I loved the clear directions of the pattern, written by Christina McKinney, so I re-fashioned the dimensions of the bag and eliminated the backpack part, instead sewing a single shoulder strap onto the bag, just before attaching the lining. 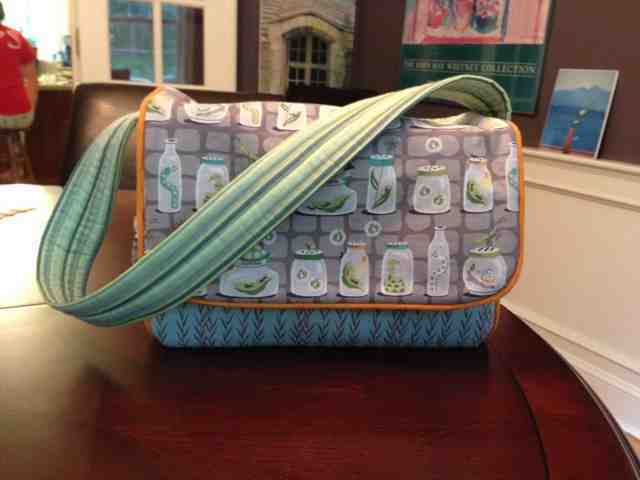 Here is one way I've come to gauge the success of my projects: that my two teenage girls want one, too! Fortunately, neither wants this fabric. Making another would exhaust the gray Bugs in Jars fabric that I've stashed, and if you are a textile addict, you know how the threat of using up something you love makes you feel! 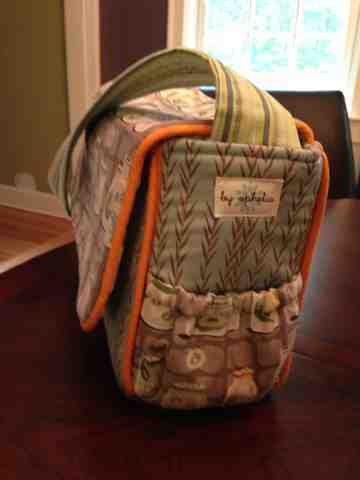 For my own edification, if I make another, I'd make the side pockets a little deeper. My iPhone sticks out an inch, and my keys have to be balled up thereby making a big bulge. Also, the lining was a little big. I copied this whole pattern into a Word document and then converted it to a table so I could re-write the dimensions without confusing original dimensions. If you want my new dimensions, which make a bag 12" wide, 8" tall and 4"deep, let me know. 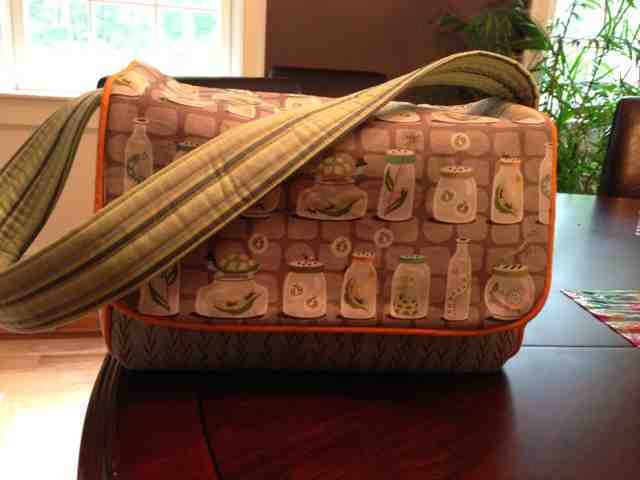 I didn't do a five piece lining, so that the seams of the lining didn't cause a ton of bulk in the corners. I did a one piece lining with boxed bottom corners. 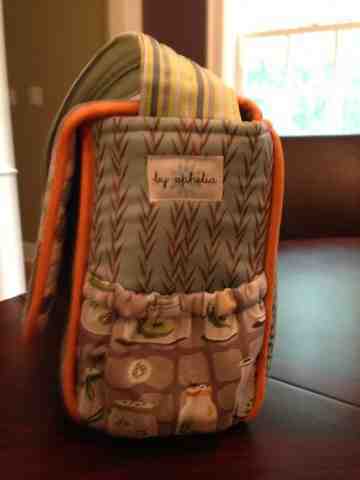 Sophia wants a laptop bag like this, so it will have to be taller and less deep. 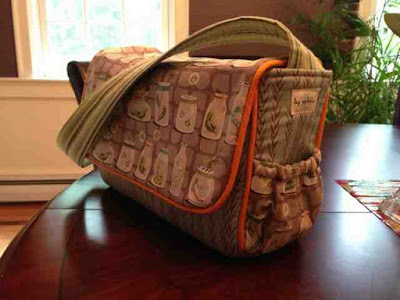 I suppose I could insert a pocket that holds the laptop up against the back of the bag so she can fit other stuff in front. I'll wait because she only has a few more days left at Shaker Road School, where the "No backpack between classes" rule has made safe transport of her laptop a stressor. She may very well decide to use her backpack at boarding school next year. Christine McKinney gets all the credit for this one. Brilliant.